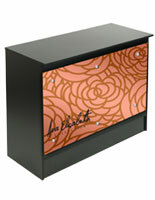 Would commerce be possible if not for the cash register counter? 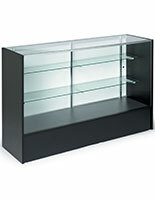 It's highly unlikely, at least for brick-and-mortar commercial operations. 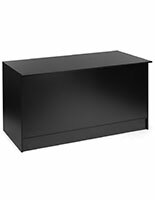 A customer service or cash register counter is the backbone of every retail establishment, service business, restaurant… the list is endless. 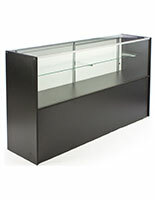 From classic wooden freestanding countertops with pull out cash drawers to multifunction work surfaces with iPad or tablet mounts and custom advertising graphics, store display furniture is designed to attract customer attention as well as facilitate purchases and other transactions. 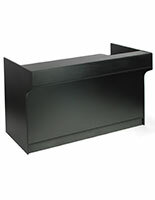 StoreFixture.com offers a huge selection of retail cash register counters for sale, also known as commercial point of sale checkout stands, all of which are available for purchase as single fixtures or as part of a full set of showroom or store furniture. 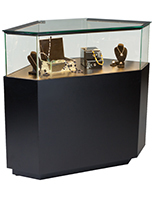 We offer a variety of countertop styles and finishes designed to complement any décor, allowing every business to build a custom cashwrap layout that matches specific operational and merchandise display needs. 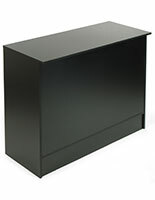 Each commercial grade cash register counter for sale at StoreFixture.com is offered at economy, wholesaler pricing and offers the fastest ship times possible, frequently shipping the same day as ordered. 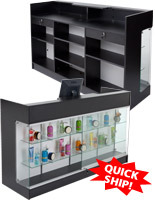 What are the different types of point of sale checkout stand? 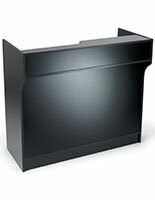 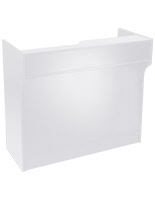 The traditional cash register counter, sometimes called the "cashwrap", consists of a recessed top area large enough to hold equipment while keeping money and transaction records out of customer reach. 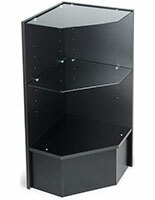 Many styles incorporate rear storage shelves for accessories and excess inventory, as well as slide-out, locking drawers. 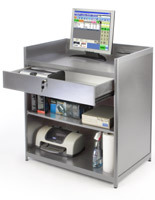 Point of sale checkout stands generally incorporate staff work surfaces as well as offering space for customers to lay out purchases or ledgetops for check writing. 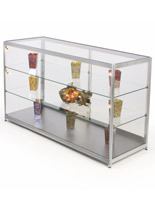 This type of multi-function fixture is frequently called a "customer service store kiosk" and located along a focal wall, separate from checkout islands or stations on the sales floor. 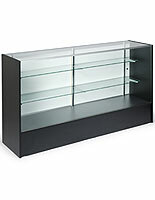 Store merchandise counters, sometimes called showroom register counters, combine product displays with checkout stations. 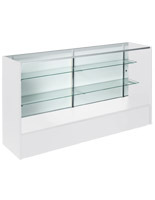 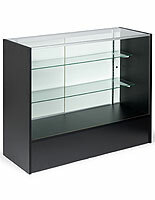 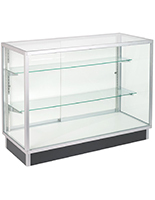 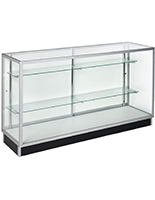 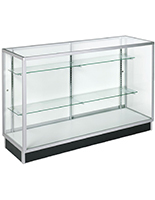 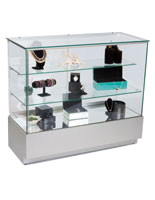 While tempered glass construction and shelves are common for delicate or high-ticket items, many retail establishments choose merchandise display fixtures with open-access shelving to increase impulse buys. 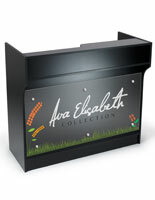 Closed-front units with flat ledge tops make ideal sampling or tester stations, as well as offering space for visual branding graphics and advertisements. 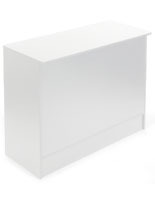 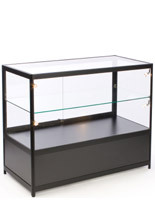 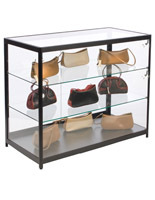 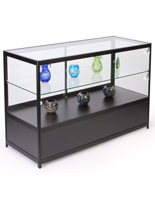 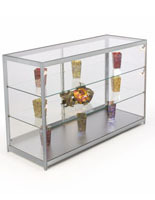 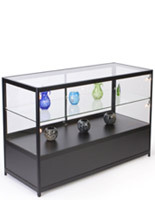 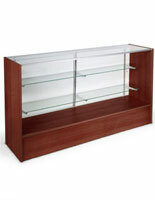 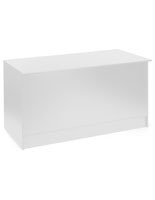 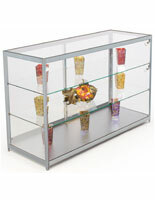 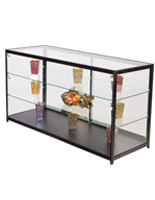 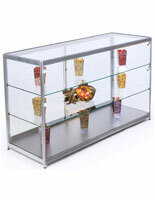 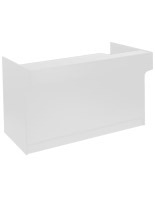 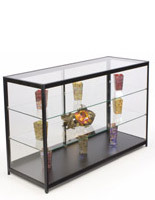 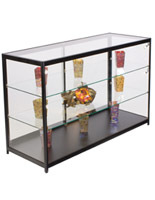 Reception or register counters frequently combine elements from other types of store display furniture. 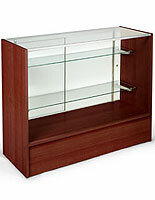 Generally located at the front of the store, or as the sole purchase station, this type of fixture will function as an employee workstation, greeting desk, customer service kiosk, merchandise display as well as a transaction countertop. 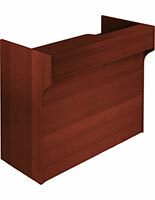 Larger than a standard point of sale checkout counter, a reception-style register counter frequently includes a ledgetop for check-writing or card processing, space for an employee-facing register or revolving iPad checkout kiosk, and even employee-only desktop space for a computer workstation. 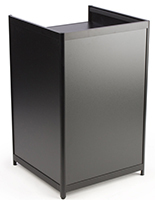 Individual sakes kiosks, when combined as a unit, are frequently referred to as a cashwrap checkout stand because the various fixtures allow one island to accommodate multiple functions, from merchandise display to cash or credit purchases, returns, and even gift wrapping. 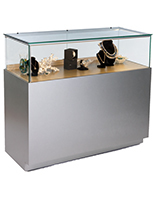 Freestanding register counters, whether used alone or as part of a multi-unit point of sale checkout stand, offer not only a variety of styles but also a variety of options. 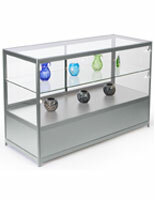 Fixed or adjustable height shelves, interior lighting, locking storage or drawers, and wheels are only a few of the many choices available. 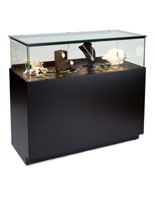 In addition, countertop width can be a huge factor when matching display fixtures to available space. 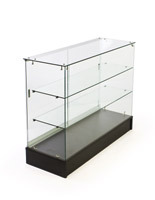 Four and six-foot wide display surfaces help declutter sales areas, while narrow 2' counters and corner units can make a group of furniture look like a custom-made sales fixture. 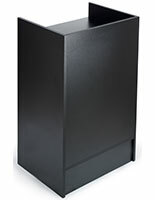 We also offer a line of extra-tall 42" high fixtures for maximum visibility in high traffic areas. 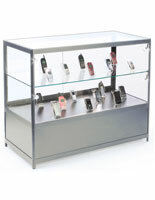 High visibility merchandise display and customer service furniture, whether multi-unit islands, freestanding kiosks, or combination units, turn any location within a retail or commercial establishment into a point of sale. 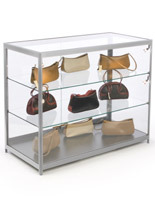 Our huge selection of sales and display furniture is curated to include styles, sizes, and configurations to meet the needs of any business in any industry.